Are you a problem finder or a problem solver? Why it matters. When I began selling years ago, my colleagues and I held a major advantage over our prospects. We owned the control over product and solution information our prospects needed to solve their business issues. Today, they own it. Nowadays, prospects are well informed and emboldened by armloads of information. The Corporate Executive Board (CEB) claim (corroborated by many research firms) that buyers complete 60 percent or more of their purchase cycle before ever contacting a salesperson. Your prospects, regardless of business sector, do the majority of their research, solution development and screening out vendors online before you can get involved. Some predict a future with the death of the salesman as face-to-face contact with salespeople becomes a fond memory like attendants pumping gas or doctors making house calls. I don’t believe it. I dug through some conflicting research and saw another side to the prediction. Sales Benchmark Index indicates that nearly 60 percent of all qualified, sales- pipeline opportunities end up in “no-decision.” A-hem. Who’s going to salvage these? Many reasons account for this development, and none of them are due to a lack of information or a jump-start prospect whose completed his buying process. If 60 percent of qualified opportunities end up in no-decision, what’s going on? A recent article in Forbes, written by Dan Schawbel, caught my attention. He interviewed Daniel Pink, the author of five provocative books about changing the world of work, including To Sell is Human─The Surprising Truth About Moving Others. As I investigated Daniel Pink’s thought leadership, I also came across a podcast interview Jill Konrath, author and sales consultant, recorded with him. 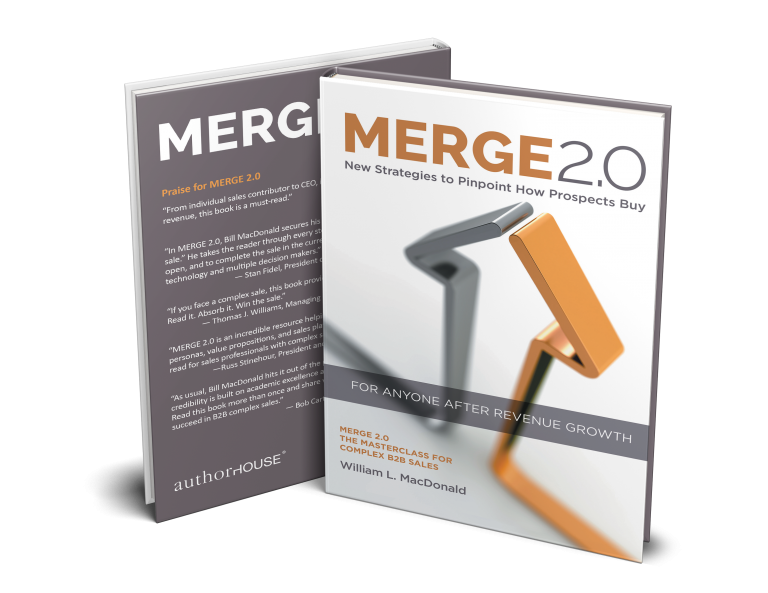 In these wise nuggets, I found supporting information for my own thinking and writing for my new book, MERGE 2.0─New Strategies to Pinpoint How Prospects Buy. The nuggets confirm that we need a different selling approach to match the prospect’s different buying process. It’s no longer about uncovering and filling needs. In this sense, the salesman, as we once knew him (or her), did die a quiet death. Is the 21st-century salesperson already among us? In one of Pink’s observations, he declares the transition from “information asymmetry” to “information parity,” and notes the subsequent impact this transition has had on the way salespeople need to approach their prospects. Historically salespeople always held the winning information cards, putting the buyer at a disadvantage. Pink explains this condition produced the “buyer beware” principle: You have few choices; you don’t control the conversation; you’re on your own. In this sense, yesterday’s buyer has died a quiet death, too. In the podcast interview with Konrath, Pink described a fundamentally different situation. Because of the research they do, prospects’ expectations have changed. Additionally, prospects now have a voice, and many ways to share vendor opinions, engage and connect: They Yelp, Twitter, Facebook, Pinterest, Instagram, Snapchat, et al. It’s a highly vocal populace. One poor quality job, one overpriced item, one service delay, you’re likely to hear from your buyer the way town criers once spread the news. 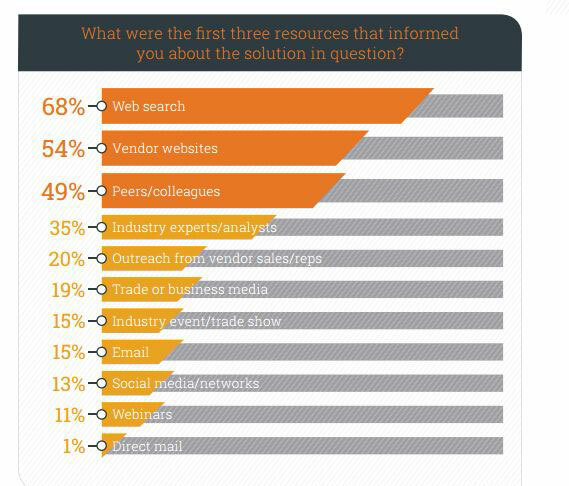 According to The 2016 B2B Buyer’s Survey Report, buyers identified their “peer/colleagues” as the third most important resource for information about their purchase (behind web search and vendor websites). Close to half (49%) listed their peers and colleagues as the top source of information, up significantly from 20 percent in 2015. Citing from the report, “From review sites to social media, today’s B2B buyers have more options than ever when it comes to finding feedback from peers. Review sites — long a staple of consumer marketing — continue to gain influence in the B2B realm. Once buyers were at the point of evaluating a set list of solution providers, 55 percent said reviews were a “very important” consideration. You can understand, then, why it is particularly important for B2B sales reps to augment and leverage their expertise, and approach the selling process from a different angle. One of Pink’s main points is the increased importance of problem finding versus problem solving. He offers this analogy: If the sales process is a timeline that goes from 0 to 100, buyers are coming in at 60 or 70, rather than 5 or 10. “And what that means is that they’re already reasonably well informed. So, if they know exactly what their problem is, they can probably find the solution without you,” Pink explains. Konrath asks an important question in the podcast: “How?” How can you make that shift? How can you be a problem finder? And his answer is dead on. Recently, I undertook a sales training engagement for a company’s 50-person sales force. The sales manager explained that his sales group had difficulty opening new opportunities with decision-making C-Suite executives. He also wanted to build an effective lead-generation program. As I continued my question process, I discovered something revealing. The real problem was not opening new opportunities; it was the ability to engage in productive conversations once his team was in the door. Only 50 percent of his team’s first meetings turned into second meetings. A costly waste of leads. It soon became clear to me his salespeople were not bringing any perspective to the prospect. Remember, the sales manager told me his salespeople needed more leads to open more doors. Instead, we built the training around targeting qualified prospects, using specific language to move the prospect to the next level, and revitalizing the team’s sales meeting plans. In another instance, a retirement advisory client of mine was brought in by a large company to evaluate its 401(k) plan. The company planned to increase its matching contribution to encourage more participation in its plan. The proposed match, based on payroll size, carried a hefty additional cost $115,000 of annual expense. The retirement consultant, my client, proposed a detailed process to evaluate the plan by first surveying the company’s employees to pinpoint the reason behind the anemic participation. The result? Employees did not understand the plan.Why this escaped management is unclear because eighty percent of employees were Spanish speaking. The unique terminology used in retirement planning confused even the English-speaking employees. By finding the real problem─communication─not more money for company match, my client closed the sale. The large company took a fraction of what it would’ve spent in matching contributions and invested in a new communication strategy that included bilingual kiosks, booklets, and Spanish-speaking enrollers. Participation grew by double digits. 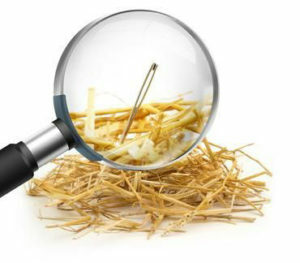 Looking for a needle in a haystack may be a worn-out cliché, but it serves to focus us on the task at hand. Assume nothing. Question everything. Look for the unexpected.